In a typical year, I’m probably on charter at least once every other month, and during that time I’ve learned (and re-learned) a few valuable lessons. Common problems usually have to do with electrical systems, reefing and tenders. However, never underestimate human nature and what kind of mayhem it can introduce into an otherwise orderly vacation. Traditional wisdom says that once your engine is running, you can operate any electrical equipment aboard regardless of the battery level. However, that’s not entirely true. On another boat, I had multiple refrigerators that stopped working when the batteries were below 12 volts. I, therefore, had to first charge up and then find and reset the appropriate breakers to get them working. It would have helped if I had asked about the location of these breakers before leaving the base. Batteries on charter boats are abused and usually kept well past their prime. Be sure to ask about their condition (although a truthful answer is doubtful) and how many amp hours there are, so you can judge the size of the bank. Keep the voltage above 12 if you can and charge often for at least an hour each time. If possible, charge using a genset rather than the engines to save fuel. Reefing is key in windy charter areas, so test the system before you need it. Raise the main either at the base or before the first evening’s anchoring. Did the last charter leave a reef in? Can you get the reefing eye to hook on the gooseneck with less than superhuman strength? Are the lines led right for the first and second reef points? Are all the other lines set and coiled correctly? On one charter we had problems dropping the mainsail. It would get stuck halfway down with the halyard all twisted and snarled. It wasn’t until I saw a crewmember coiling the halyard from the bitter end in toward the mast that I realized just how much twist was being introduced into the line and why it was tangling each time we dropped the sail. It would have never occurred to me that anyone would coil anything (line, hose, etc.) from the bitter end in, so my lesson was to henceforth assign duties with very clear directions, no matter how seemingly obvious the task. Absorbed in the complexities and the excitement of checking out the big boat, it’s easy to overlook the little one. The tender is your lifeline to shopping, dinners ashore and shallow-water excursions to snorkeling spots and beaches. This is your one and only car, and there’s no taxi or ride service to fall back on. Take no one’s word for the behavior of the outboard. Start it before you leave the base. Run it for longer than a minute and check for water coming out. Lay eyes on the dinghy pump, insert the plug and check the fuel level yourself. Make sure you have the engine kill switch key and designate a place for its safekeeping. (Fifty lashes for the one who doesn’t put it back into the nav desk when finished.) Also, make sure that locks have matching keys—that’s experience talking. Base managers know their boats and all their strengths, problems, quirks and general weirdness. That doesn’t mean, they’ll tell you about them. If anything sounds like it may have been omitted or glossed over in the charter checkout—ask. Drill down and listen to what’s not being said. If the checkout guy says, “If all the alarms sound simultaneously and the batteries instantly go to 9 volts, turn off everything including the engine and reset,” —don’t assume this won’t happen. With a thin veil, he’s telling you how to fix a problem that he’s not really telling you about. The most important lesson I’ve learned from chartering is that I haven’t seen it all—by far. Just when I think I can anticipate every combination and permutation of boat issues and crew antics, I am humbled by a scenario that I couldn’t have imagined. The unpredictability of the human factor is the lesson I re-learn most often. It’s important not to take any crew perspective or direction given for granted. With new crew, never assume they can operate a winch, will keep hair/fingers/drinks away from the windlass, or know to put a line through the mooring ball hawser and not the handle of the plastic jug that’s tied to it (true story). Good luck, and learn fast. 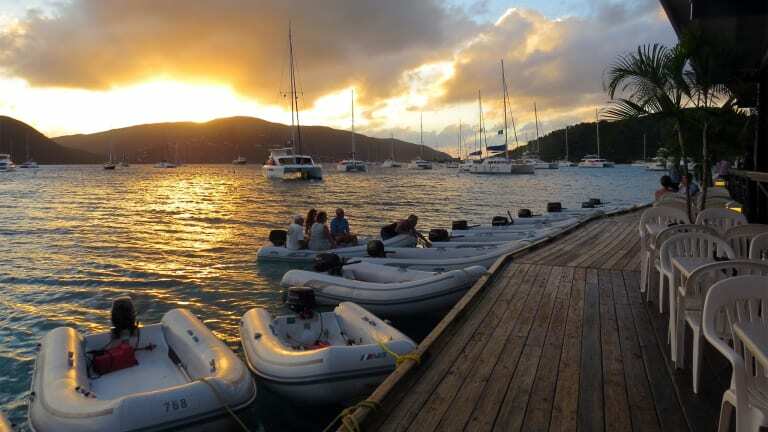 Conch Charters has added three new boats to their fleet in Tortola: a Lagoon 450 sailing cat and two Leopard 47 power cats.